I know, it is much too early to be thinking about winter. Or is it? I'm already feeling the chill of late summer nights. What a relief, after the heat we've had. One of the loveliest things I saw on my trip to Maine was Judith and Lee's stack of wood in the mudroom, all ready for those cold November nights. There is something about correct form in sizing and stacking that makes for a deeply reassuring sight. Note the log carrier, properly curled, awaiting its next load. Let the snow fall! One of the best house presents ever came when friends of mine took my wood pile ( and it was a pile) and stacked it perfectly. It took them no time at all (one of them was an architect) but I nearly cried with gratitude when I saw it. With my three-sided fort of wood I knew the winter's flaw would not have a chance to chill me. I would be warm and safe that year. You must see my dear darling husband's wood stacks. It truly is an art and I keep telling him he could start a blog devoted to wood and to building fires to keep the hearth and home cozy. There's nothing that gives quite the feeling of plenty and security like a nice stack of seasoned firewood. I say bring on the season! Thanks for this beautiful reminder. I need to order wood for the winter. This photograph gives me hope. This hellacious summer will soon be on its way. Right? If you did this in California (we have no mud rooms) the logs would be filled with termites as would your home. Wood here is stacked outside. But this does look wonderfully artistic to me. Your photo reminded me of a beautiful contemporary woodcut. I put the scanned photo on my blog. Having had to rely on wood for heat off and on over the years I really appreciate a good stack of wood. I've also learned that achieving a stack this neat is not as easy as it looks. I've come to appreciate not only having a good supply of wood but to have it artfully and neatly stacked is a talent unto itself. 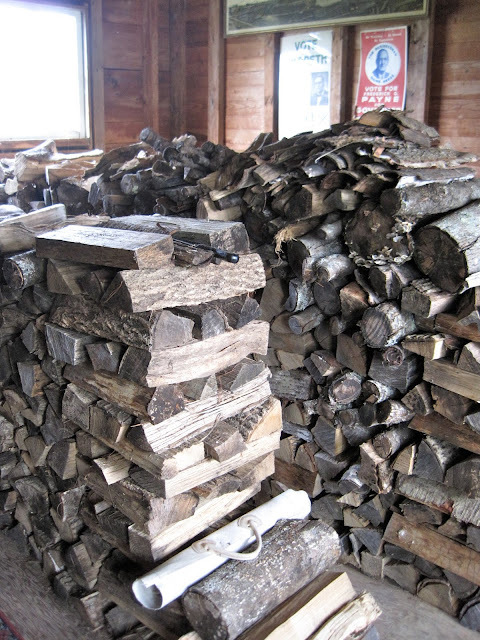 One of my favorite sights, a perfect stack of winter-ready wood. At our summer cottage we scour the lake for fallen birch trees, which happens too often, pull them to the cottage behind our boat, drag them up the beach and around the cottage with ropes and leave them to dry. Eventually they are chopped and stacked, often requiring several attempts to achieve the perfect stack. A work of art, a beautiful stack of wood! I'm midway through Slow Love and enjoying it very much. Finding myself on many of the pages. Thank you, for putting to the page the thoughts of many! It sure feels almost wintery here on Cape Cod today! Fall is certainly how it feels today here on Long Island! Some trees have started turning colors ... not sure I really welcome winter, though. I still remember the shoveling a few months ago, and have no need to do it again so soon ... if Fall would stay a little longer, that would be lovely! I love a wood pile. When my small home was built a year and a space was cleared in the woods I had the workers stack wood by my home. Oh, how I wanted a wood burning fireplace or stove like years past. But at 3 score and ten I went with gas logs. But still have the wood pile for a outside bonfire for my little grand daughters. We can cook hot dogs and marshmellows.. The thing I love most about my rambling, old house with the clumsy floorplan, is the immense site built fireplace that takes up the entire west wall of our family room. Out back of the house my husband has positioned two old metal fence posts to create his wood pile. It will be at least late Oct. before we build our first fire. Every cool night we will have a fire and my grandkids love to come over and roast marshmallows on old wire coathangers. I do love summer, but the heat & humidity is so intense by August that I welcome the first cool breeze of autumn. Unfortunately, it will be a while yet before it arrives! That being said, a beautiful stack of firewood is a gorgeous site, isn't it? It says "Home, Hearth, and Welcome" like nothing else. Even the words 'wood pile' have a cosy sound to me. We began lighting log fires again last winter and keep a few logs in the basket and a few more in the cellar. How I would love a huge stack of logs like this! Beautiful wood stack! And so clean!!! Why do my dh's wood piles always contain leaves, dirt and detritus from the woods that then tracks into the house?! I will have to show him this picture and highlight it's beauty and lack of flotsam! Someone knows how to stack firewood. This is the neatest stacking I have seen. And lots of wood. I hope this is enough for a winter. Sure looks like it. Around here we see huge stacks of firewood outside in peoples yards with canvas tarps tied down over them. Now if you want to see some REALLY artistic woodpiles, Dominique, check out Alastair Heseltine's . These are incredible! We tried to make ours a bit like this, but didn't quite succeed.